Ok…so you already knew that. It's no secret around here that I've been using this fabulous font in almost every design or project or Instagram post lately. I love that it can be simultaneously fancy, fun, casual and whimsical. I really cannot get enough. LOVE it!! So as you might imagine…when Debi Sementelli, the artist behind the creation of this beautiful font, reached out to me about wanting to do a blog post about some of the ways I've been using it, I. was. beyond. flattered. Coincidentally, through conversations with Debi I was happy to discover my favorite app by Rhonna Designs has commissioned Debi for the use of the Cantoni font in a new soon-to-be-released update. I'm SO excited about that and thought it was so amazing to think two of my favorite things will be merging together! Can you say match-made-in-heaven!? I really enjoyed conversing with Debi through emails and learned that for her, the process of designing a font takes about 6 months. Wow! I had no idea!! That's a lot of love, time and effort put into creating a beautiful font like Cantoni and it makes me adore it all the more!! I also learned how devastating it can be to a professional lettering artist like Debi for people to illegally share her fonts. One of Debi's fonts has been shared illegally over 2500 times. Yikes!! I share all of this because I think it's important to remember that there's a face behind your favorite font. There's a person, just like you and me, who's working hard to get their art/work seen by the world…and to be justly compensated for it. I'm so happy to have been able to connect with Debi directly! She's a font celebrity in my little world of graphic design and I'm truly flattered to have my projects featured on her blog! Thanks again for the feature Debi!! 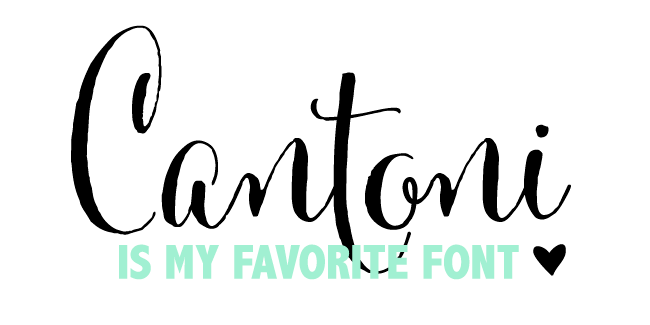 If you want to purchase the Cantoni font too...GO HERE! Or check out the NEW Belluccia Bold font by Debi Sementelli…released just last week! Super Bowl last night….right? "Woo. Hoo." (said with sarcastic enthusiasm). but I'm just NOT. I'm annoyed by it much of the time I think mostly because I live with someone who's a complete diehard fan and allows it to dictate much of his schedule/activites/time with family during football season. (and apparently the rest of the world is pretty much the same way). SEE UPDATE BELOW! I, however, am one of those people who's more about the food, commercials and the half-time show. With that said, I do have to say I was pleasantly surprised by the performance from Bruno Mars last night. He is a true entertainer and the collaboration with the Red Hot Chili Peppers was AMAZING! I wasn't expecting to have my socks blown off. Did you all feel the same? - He's 100% dedicated to being the best dad ever…and I have to say…he's pretty dang awesome. I wouldn't describe him as the cuddly teddy bear type but as abrasive as he can sometimes be he has won over Ella's heart. He has somehow managed to find the perfect balance between effective parenting and nurturing. I personally am still working on this as I tend to be a "softy". 1. Surprised to know Ella really has a mom and not just a dad. 2. Disgusted that I never do the shopping myself…how dare I pass along that task to J.
I enjoyed the Bruno Mars portion of the show very much, but I thought the RHCP were terrible. And I thought commercials were mostly boring, although my favorite was Budweiser's "puppy love" commercial...awwwww!